One of my goals for The Chic Life in 2017 is to bring back more of the Healthy Living theme. I had dialed back from that over the last few years for several reasons. One of those being that I hit a great stride with my weight loss where it became sort of who I am versus something I was striving to maintain. Over time, I stopped counting calories and paying so much attention to what I was eating, and my weight stayed the same. Well, my size stayed the same. I’ve basically stopped weighing myself and now judge my health more on how I feel and how my clothes fit. It sounds so cliche, but eating and living healthily became part of my lifestyle. Once I wasn’t blogging about weight loss, I wasn’t sure what to say about healthy living. I’m still working on the best ways to bring the topic into posts. But, I had an idea for one thing I could start sharing – upgrades. One thing that has stayed the same is that I’m always looking for newer, better ways to do things, especially when it comes to healthy eating. I’ve maintained a key lesson from Small Changes, Big Results (the book that helped me kick-off and work through my weight loss). You can read about that by looking at the posts with the category SCBR. The lesson was to not classify ingredients/products/etc. as “no foods”. Nothing is off limits. And nothing is considered “bad”. For someone with a restrictive eating background, this was really interesting. And while I still don’t like calling any foods or products “bad”, I do work certain things out of my eating. Rather than focusing on what I can’t have, I focus on if there is something better out there. Especially for things I eat often. One thing I have almost every day – a fried egg. I grew up eating fried eggs cooked with non-stick spray. But as I started looking into healthy living, and clean eating specifically, I found non-stick spray became pretty unappealing. I mean, have you ever looked at the ingredient list on a can of non-stick spray? Some can be pretty scary. And really, who wants to eat “propellant”? If you were cooking an omelet, you wouldn’t say, “Let me toss in some spinach, cheese, and a dash of propellant.” Right? For my first upgrade, I started using butter. I found I didn’t need very much, so I wasn’t worried about the extra fat/calories/etc. it was adding. And while butter is arguably not “healthy”, I figured at least the butter could be made more naturally than non-stick spray. And it would keep me from eating propellant. 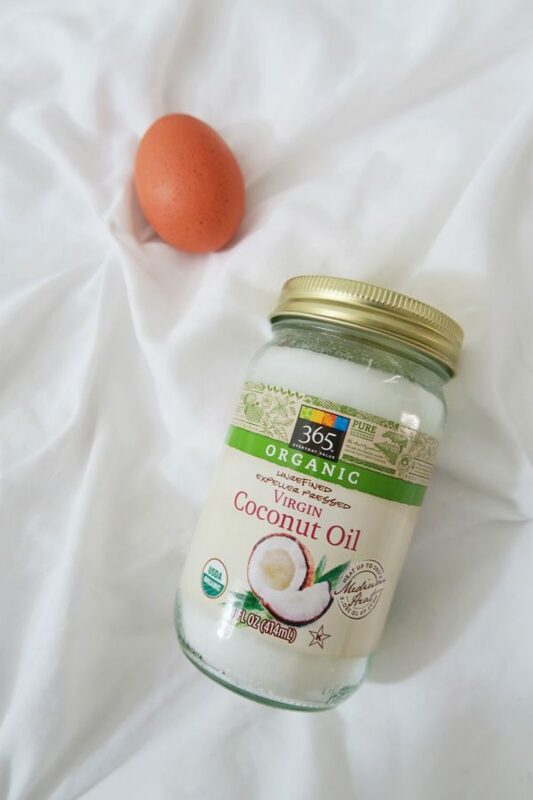 When my friend Angie was visiting, she reminded me that coconut oil was great for cooking fried eggs. I first started experimenting with coconut oil when I made those raw coconut macaroons (mmm…). I had intended to try the coconut oil for many other uses, but never quite got around to it. But, I’ve been using it for my fried eggs with good results. The eggs don’t stick at all to the pan. And like with the butter, I don’t need very much at all. I think I use less than 1/2 teaspoon. If you try this, you’ll note a slight coconut taste. I kind of like it, personally. But if you don’t, you can use olive oil instead. But is it healthy? This is something I struggle with when I’m researching almost all foods. The research out there is so confusing and you’re not really sure who to trust. I do think coconut oil is a fairly undecided ingredient. Some sources say it’s healthy while others say it isn’t. This Harvard article mentions that more research is needed but says coconut oil should be fine to use sparingly. For me, this is where I try to simplify things and focus on what’s better. Non-stick spray or coconut oil? For me, I’m going with coconut oil. As far as butter versus coconut oil? I guess the jury’s still out. But coconut oil is obviously better if you’re looking for a plant-based diet.